A new innovative one-step disinfectant cleaner specially formulated for the majority of water damage restoration jobs. 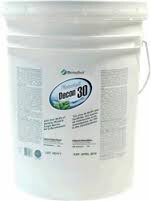 Using the same Thyme Oil ingredient as Botanical Disinfectant, DECON 30 includes a cleaner surfactant and features a low thyme fragrance. Safer than even vinegar it requires no Warning Labels or First Aid Statement. Thyme oil based, Benefect Botanical Disinfectant is a ground breaking botanical disinfectant proven to kill over 99.99% of bacteria and surpasses the U.S. Environemental Protection Agency’s requirements for broad spectrum hospital disinfectant. Safer than even vinegar it requires no Warning Labels or First Aid Statement.